Emirati Khalifa Khouri was one of the breakout stars of the National School League (NSL), showcasing his skills while leading the International School of Choueifat to the Under-14 final. ISC fell short of capturing the inaugural title, losing 31-15 to Indian High School Dubai, but represented the nation’s capital well as the only Abu Dhabi team to reach the semi-finals in either age group. Khouri was the engine that made the team go, acting as the playma-ker from the point guard position. 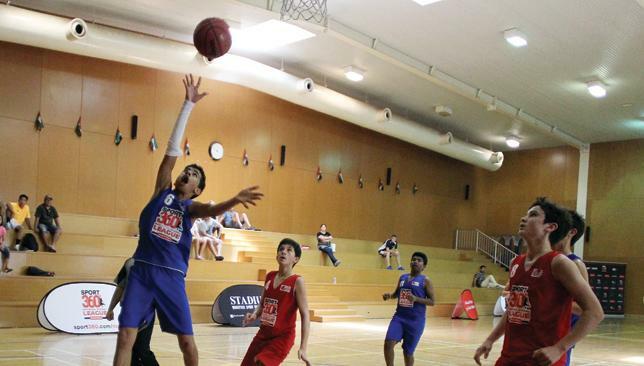 He finished tied fourth in the U14s with 64 points and as the only Emirati in the tournament, showed there’s plenty of basketball talent among the local youth. “I take a lot pride in it because I think I’m the only Emirati player to play in the NSL,” Khouri said. Khouri, who’s eyeing the U16 UAE national team, sta-ted he wants to continue improving, especially his shooting and dribbling, by attending former NBA player Jawann Oldham’s summer camp. He’s also looking forward to playing with point guard Karthik Raj, who led ISC’s U16 team in the NSL, as he steps up to his school’s senior team next year. “We have an U15 team and I play point guard with Karthik there. He’s a good player and I learn a lot from him,” Khouri said. ISC coach Stefanita Buzatu witnessed firsthand the development of Khouri in the NSL and is excited to have the duo of dynamic players at his disposal next season. “One of them has the speed, one of them has the shooting, so I hope I can give them more games to play in,” Buzatu said. Hashim Hazeem (white) was one of the stars of the NSL. Top talent, highlights, raucous crowds and thrilling endings made Sport360°’s National School League (NSL) Basketball a slam dunk in its first edition. 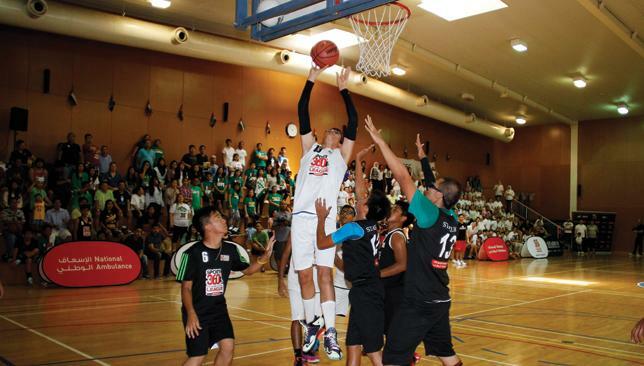 The nation-wide tournament brought together teams from the three geographical locations of Dubai, Abu Dhabi and Sharjah to compete in a month-and-half long hardwood clash to crown a UAE champion in two age groups. Under-14 featured four schools from Abu Dhabi, six schools from Dubai and six schools from Sharjah, while Under-16 was expanded to two four-team Dubai groups, along with five schools each in Abu Dhabi and Sharjah. Backed by the full support of the UAE Basketball Association, the NSL united various ethnicities and playing styles to showcase the best of the best in youth basketball across three venues. Games were held at GEMS Sports Academy in Dubai, New York University in Abu Dhabi and Victoria International School Sharjah (VISS). Playing as hosts in the championship, VISS claimed the Under-16 title in what turned out to be the most exciting contest of the entire tournament. The atmosphere was electric as fans for both VISS and the New Filipino Private School (NFPS) filled out the stands and passionately cheered for their respective teams in a heated, back-and-forth encounter. The fight displayed by undersized NFPS was indicative of the level of competitiveness that all the schools had shown throughout the tournament as players battled until the final whistle. It took the final seconds to decide the championship, with centre Hashim Hazeem’s playmaking the difference. The big man had a monster effort with 21 points, 20 rebounds and six blocks to be named the NSL Final MVP, while his 100 points, 82 rebounds, 19 blocks and two steals for the tournament earned him the U16 awards for Best Defensive Player and Most Points Scored. The 42-41 victory by VISS capped the competition in style and coach Russell McKie, who was elated to have the school go down in the history books, hopes for an even larger field in the following edition. While two Sharjah teams collided in the U16 final, Dubai and Abu Dhabi met for the U14 title as all three regions represented on the grand stage. Indian High School Dubai completed their impressive run through the tournament with a 31-15 win against the International School of Choueifat to finish undefeated and a cut above the rest. Indian Hoopstar point guard Lavesh Zuting earned the NSL Final MVP for his eight points, three steals, two assists and one rebound in the championship game, as well as NSL MVP for the U14s as he brought his total tally for the tournament to 79 points, 20 steals, 11 assists and eight rebounds. In the end, the initiative achieved its goal of providing a platform to develop basketball in the UAE. Matt Burn, Sport360° sports event manager, said: “NSL Basketball was yet another step in the right direction for school sport in the UAE. We worked hard to try to deliver a professional and exciting competition for the kids and coac-hes and I believe this was achieved. After successful first editions of the NSL Cricket and NSL Basketball, Sport360° will continue to grow grassroots sport with the upcoming NSL Football this autumn. “The NSL adventure does not stop here though, only last Thursday we launched the inaugural NSL Football which will start on September 27 and on top of this, season two of NSL Cricket will start in the first week of October,” said Burn. Sport360 brings you all the drama as VISS beat NFPS Patriots by one point to win the inaugural Under-16 National School League Basketball title. Please click here for more on Sport360's National School League.